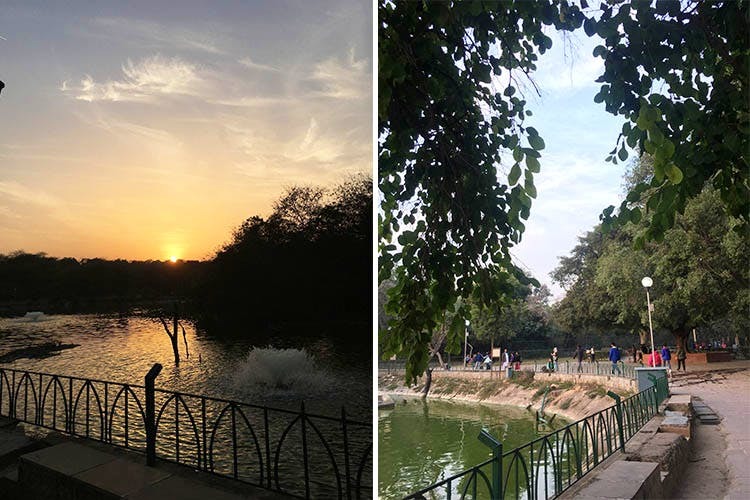 The Deer Park in Hauz Khas is a treat for photographers, has pretty sunsets, a variety of birds you can spot and (if you’re lucky) some glimpses of deer. Its pretty gardens and the Hauz Khas Lake are also worth mentioning. If you’re into photography, the sunset at Deer Park is definitely something you ought to capture on camera. The park is green and serene and is especially pleasant towards the end of the day – don’t go after dark though, it gets a lot less safe. Bear in mind, it’s also massive and can take close to three hours to explore entirely. We recommend you keep yourself well-hydrated. If you go in the day, it’s got a lot of stuff to photograph, like deer, different species of birds including peacocks, the rose garden, and of course, those sunsets we mentioned. If you’re looking for a fun, family picnic spot (in better weather), you’ve found your Mecca. The park is pretty well-maintained, and it’s nice to have a slice of nature in the middle of the concrete jungle. You can head over to the famous Hauz Khas lake to feed the ducks, or to the informal skating rink with your friends. If nothing else, just go with a book and sit in one the gazebos and enjoy a quiet read (again, save these plans for sweater weather). Stop by this park on a day the weather’s good, and spend a few minutes getting some reading in or watching the sunset. Hauz Khas is more than just the Village.